Spirit 03 is a revered name in the AFSOC community, often spoken of in hushed and pained tones. It was the call sign of the last AC-130 gunship shot down in combat. The story of Spirit 03, whilst sad, was also one of heroism — the kind you'd find in the US Air Force Special Operations Command community. It was a story of American airmen putting the lives of their brothers in arms engaged in grueling ground combat above their own. On January 29, 1991, over 2000 Iraqi troops under the direction of Saddam Hussein streamed into the Saudi Arabian city of Khafji in an attempt to draw American, British, and Saudi forces into a costly urban battle which would tie up Coalition troops until the Iraqi military had time to reorganize and get themselves back in the fight. Just days before Khafji fell, American surveillance jets had detected large columns of mechanized Iraqi units pouring through Kuwait's border in a mad dash towards the city. Though the warning was passed on, Coalition commanders were far more focused on the aerial campaign, which had seen the virtual annihilation of the Iraqi Air Force. Thus, Khafji fell... but it wouldn't be long until Saudi forces scrambled to action, barreling towards their seized city to drive the occupiers out. American and British aerial units were soon called into the fight, and in record time, engines were turning and burning at airbases within reach of Khafji while ground crew rushed around arming jets for the impending fight. Among the aerial order of battle was a group of US Air Force AC-130H Spectre gunships — converted C-130 tactical transport aircraft that were armed to the teeth with a pair of 20 mm M61Vulcan rotary cannons, an L60 Bofors 40 mm cannon, and a 105 mm M102 howitzer. These Spectres, based out of Florida, were eager to be turned loose, planning on adding any Iraqi tanks and armored vehicles they caught around Khafji to their kill tallies. On the 29th, Iraqi mechanized units moved towards the city under the cover of night, repeatedly engaging Saudi elements set up to screen inbound enemy ground forces coming in from Kuwait. The Spectres were already in the air, racing towards the fight and running through checklists in preparation for the destruction they were about to dish out on Saddam's armored column. Within minutes of appearing on station, the AC-130s leapt into action, tearing into the Iraqi column with impunity. What the enemy forces had failed to realize was that Spectres — living up to their name — operated exclusively at night so that they were harder to visually identify and track, and the gunners aboard these aircraft were incredibly comfortable with that. Spectres began flying race track patterns in the sky, banking their left wing tip towards the ground as their cannons opened up. Despite the AC-130s inflicting casualty after casualty, the resilient Iraqi invasion force continued to advance to Khafji and managed to briefly take over and lay claim to the city. American and Saudi ground combat units, including Navy SEALs, Army Special Forces, and Marine artillery and infantry elements responded in kind, and launched a blistering offensive against the Iraqis as night turned to day and the AC-130s returned to base to rearm, refuel and wait for nightfall to resume hunting. On January 30th, Spirit 03, one of the AC-130s, was loaded for bear and launched with the intent of providing Marine forces with heavy-duty close air support. Spirit 03 arrived on station and started hacking away at targets. 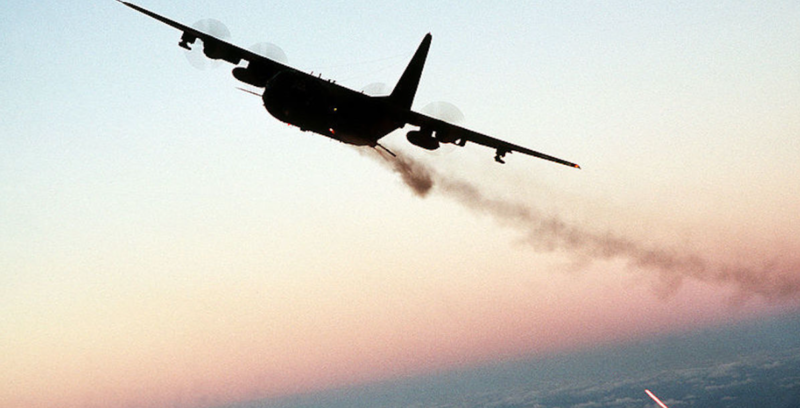 In the hours around dawn on the 31st, the AC-130s were recalled to base when radios lit up with numerous calls for fire support from the beleaguered Marines on the ground. An Iraqi rocket battery needed to be dealt with quickly. The crew of Spirit 03 took charge of the situation immediately, judging that they had enough fuel and ammunition left for a few more passes. Not quite out of the combat zone, the aircraft turned around and pointed its nose towards its new target. It was then that all hell broke loose. A lone shoulder-fired, surface-to-air missile arced towards the AC-130, detonated and brought down the aircraft. In the months and years that followed, the loss of Spirit 03 was investigated and then quickly hushed up. Some indicated that the official report blamed the crew for knowingly putting themselves in danger by continuing to fly in daylight, allowing themselves to be targeted. Others knew that the story was vastly different—that the 14 men aboard the AC-130 knew that they were the only ones in the area able to provide the kind of fire support the Marines needed, and so paid the ultimate sacrifice while trying to aid their brothers in arms.